I don’t know about you lot, but I really enjoy ArenaNet‘s Points of Interest livestream that airs on its official Twitch channel. It contains a massive amount of juicy information that often rewards its eager audience with crisply presented details, outstripping that found in the quick news posts on any given topic. Needless to say, it’s almost always worth my while tuning in. Last Friday’s livestream was particularly interesting, however, in that Game Director Colin Johanson hinted that in Heart of Thorns challenging group combat requires the uptake of more traditional tank, DPS, and healer roles. The traditional MMO holy trinity isn’t something that springs to mind when I think about my beloved Guild Wars 2, so I felt the need to rewatch this section of the stream repeatedly to really get to the heart of Johanson’s message. In this edition of Flameseeker Chronicles, I’ll attempt to disassemble what was said, discuss Johanson’s later written clarification, and attempt to figure out what this might mean for the upcoming expansion. This is going to be a bumpy ride for sure, so buckle up and stick with me! Before I launch right in here, I have to point out how welcome it was to hear a developer talk about how beta testing should be used and how a true beta test requires plenty of feedback. This is certainly something I can get behind, and I know that HoT will be a much better product as a direct result of this emphasis on interactive, feedback-led testing. I’d urge you all to get chatty whenever you play any beta content: ANet needs to hear your feedback, and the more constructive you can be, the better our expansion will be. On to the good stuff! Let’s firstly look at what was said during the livestream: Johanson opened up his discussion of the holy trinity’s place in HoT by pointing out that our first glimpse of the Revenants was relatively “tanky,” especially with the slower hammer and original legend combination that was thrown to us for breaking testing. 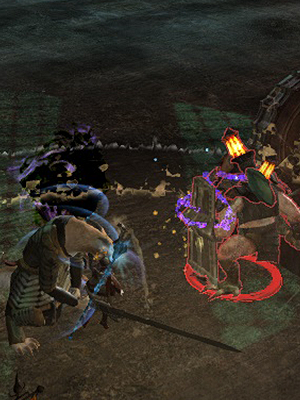 As he argues, though, the tests of Ventari have proved that a supportive healer role is possible within the game’s newly envisioned combat system. Johanson dubs this revenant playstyle the “closest thing to truly just playing straight-up as a healer that you might find in more traditional MMO experiences,” and I can see that from the little time I’ve had to tinker with the profession. Although I can see how that might work and the revenant profession seems to be developing well, the true validity of the new playstyle has been very problematic to test due to the current lack of challenging group content that throws the player into scenarios in which a dedicated healer might be necessary. We heard Johanson admit that “there are not a lot of super-challenging encounters in Guild Wars 2 right now,” but he was quick to point out that “it’s one of the big things [ANet is] focusing on with this expansion.” We can see already that the current combat system doesn’t synergise well with traditional roles, so does this mean that the game’s entire combat system will end up drastically different in HoT? I’m expecting that the incoming raid system will have plenty to do with the studio’s version of engaging group content, and now it seems that it may require dedicated tank and healing roles. Johanson claimed, “We never said that we don’t want to have the DPS, the tank, and the healer in the game, and I think that’s a common misconception. We just don’t want people locked into those roles forever.” I can’t blame you for feeling a little bit confused right now because a good proportion of the game’s playerbase see the holy trinity as an archaic and even negative force in MMOs that GW2 had rightfully moved past. The immediate response from fans has been to draw back on how the game’s departure from the trinity was pushed heavily as a unique selling point before its initial release. 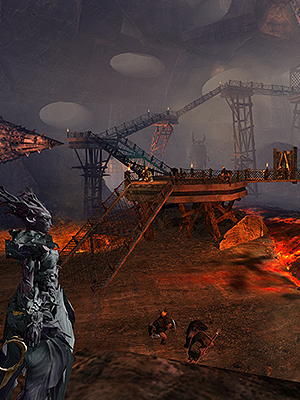 Has ANet done a crazy 180, or is there more to it? Was GW2 really supposed to abolish the trinity? To put some sort of answer forward, I gave myself a little refresher in the pre-GW2 hype train that proceeded the game’s launch. I found myself thinking about whether we really had misconstrued what was said during the promotion of the base game. Back in 2011, Eurogamer interviewed Johanson about how he thought ANet made MMOs better with GW2, and his answer referenced “taking the holy trinity… and just throwing it out the window” because its application in the genre was tired and uninteresting. How then did he jump from throwing out the traditional combat roles to embracing them? Ultimately, DPS/heal/tank just didn’t cut it in our book…er, game. Our players demand more from Guild Wars 2 and we intend to deliver on that demand instead of delivering more of the same. Not only is the trinity very formulaic, but it leaves out a lot of gameplay elements that make many other games so much fun. Instead, we break these trinity categories down into a cooler, more versatile system. We like the way combat works right now, we really don’t plan to change it much other than add more options with elite specs. It works the way we intended: you can play control, support, and DPS actively. To folks who prefer to define by the holy trinity, GW2 doesn’t force you to pick one of the three from heal, tank, or DPS and only do that – it blends a mix depending on your build and allows you to actively swap roles or soft play between roles. Our goal was to remove the forced singular role you’re locked into, people often mistake this as saying GW2 has no trinity elements, that isn’t true – we just don’t believe in a forced role for the reasons I covered in the livestream. That said the point I really wanted to make in the livestream was the issue with the combat system in PvE isn’t the combat system. It’s that the mobs and encounters we have provided so far very rarely allow/encourage you to make use of the combat system as intended. There are some exceptions, but one of our goals with HoT is to help allow more room for players to experience the full range of the combat system in PvE. From the common world mobs up to the challenging group content we will talk about later, we are asking our design team to design encounters in PvE more focused on using the system we have built. If ANet didn’t ditch the trinity, was GW2‘s combat that unique? If we accept that Johanson did not in fact do the fastest u-turn ever with his livestream words and quick Reddit clarification, then what does that mean for GW2’s combat as a unique selling point? If the MMO merely iterated on the combat trinity rather than obliterating it altogether, then how different can its mechanics really be? Well, we know that games such as World of Warcraft had already introduced fluidity to the combat lineup. Taking WoW as an example while I’ve mentioned it, hybrid classes like the Druid, Monk, Paladin, and Death Knight could already switch between tank, healer, and DPS roles as required using each class’ specializations. RIFT lets players switch between roles by swapping which souls are active, and EVE Online ties particular roles to specific spaceships. If GW2’s development team simply wanted to call stopping players from being locked into a single role a unique selling point, then it had already been done. 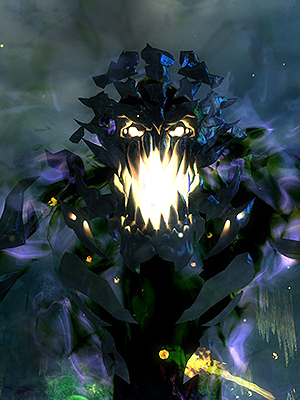 The unique-to-themeparks element of GW2‘s combat, though, is that each player is essentially all three roles simultaneously, rather than able to switch between them only outside of combat. Dodging and crowd control act as a kind of distributed tanking mechanic by reducing incoming damage, and every class has a self-heal and other supportive abilities. Players are largely responsible for mitigating or healing their own damage, which really does undermine the usual spin on MMO combat’s holy trinity. I’d like to see the challenging content promised by Johanson that will force me to best utilise my freedom and make strategic choices that are more than just a throwaway glance at my off-cooldown abilities. I do have an issue with ArenaNet’s newly invigorated emphasis on redefining the use of control, support, and damage: How will each profession remain balanced and adaptable when we start exploring the capabilities of the elite specializations and inevitably draw the conclusion that certain professions are much more adept at specific roles than others? If we find that any profession has an edge at either of the three roles, will those players be penned into that playstyle for the new challenging content that requires each role specifically? I guess I won’t be able to quell those concerns until I know more about the content that’s set to affect my combat playstyle. I’m sure, though, that flavour-of-the-month favourites will emerge and players will have to either adapt to their chosen profession’s favoured role or roll a new toon. What do you think? Are you happy to see the apparent focus on specific combat roles? Do you think it might make content more technical and challenging, or will it only serve to hem players in? As ever, tell me your thoughts below. Nyphur These types of mechanics you are talking about are what’s coming. We already have them to a degree with the Silverwastes bosses and the last boss of the living world season 2. Nyphur Healing isn’t an issue in GW2. If is, then you’re not moving around and timing your dodges. However you are right about the short defensive skills. None of Guardian’s wards last long enough to revive another player. None for the defensive skills are worth using proactively because they are too short with unreasonable cooldowns. I’ll be honest here: I love the game, I HATE the downed system. I can see what they tried to do with it, but honestly what the downed system meant was that people had to be inherently more fragile to balance out in dungeon content. It made things, for me at least, feel very very punishing. Miss one dodge? Splat, on the floor in the middle of a death field that no one dare go into lest they too fall over. Personal opinion of course. Buuut I feel like the downed system needs to be rethought, or replaced in some other way. 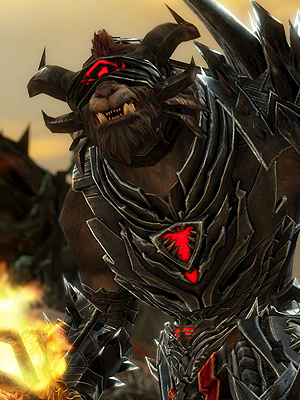 Just one more drop in the bucket of lies and failures that is Guild Wars 2. ArenaNet used to be a great company, sad thing is they’ll probably be remembered more for the failures of GW2 than the successes of the original. Need to buff the rest of the game to make it as important as damage. Maybe make damage stat add so little that it is pointless (like what you do with healing)… or buff the rest of the stats so something like the celestial sets are the best. HeckHound Nyphur I actually like specialisation and don’t is a symptom of the problem, I think building unique characters and getting bonuses to one play style over another is a really core part of MMOs. The symptom I’m referring to is the fact that each class only has a few party-wide or area-effect support/heal skills and that they’re all completely optional. In order to make every build viable in PvE, ArenaNet has had to make it so none of those support abilities are actually essential to completing the content. And if you don’t need them, then why not just stick on Beserker gear, stand in the corner of the room and deal DPS? That’s what we’ve ended up with, and it’s really sad. All I want to see is more group support abilities and PvE that requires them to be used strategically. I’m getting the sinking feeling that the “challenging PvE content” we’ve been promised may just be content that just deals enough DPS to require specialised tanks and healers, and if it is then I’m going to be a bit disappointed. I agree with that falling back on the Trinity being the wrong way to fix it. Well, not necessarily the wrong way but an unneeded way, given how you have mechanics that allow for a much more diverse set of roles. * Even without traits or a group healing skill on slot 6, all classes have some degree of party-wide support – Mesmer’s have Glamours and some Phantasms, to keep with the Mesmer example. Traiting just improves them. Time Warp lasts longer, grants superspeed and Resistance as well as Quickness, or Phantasmal Defender can be improved to apply the damage reduction buff more often and grant regen. Personally I welcome any change to GW2’s current holy trinity of DPS, DPS, DPS. Nyphur HeckHound Oh there could be much more in GW2 besides tanks and healers. Take a party with a Ranger, Mesmer and Necromancer. These three alone can make a pet/minion/decoy army that is TWICE the size of a dungeon group. A Necro, Guardian, and Engineer together can blind a target for so long it may never actually land a hit at all. Any number of combinations of professions can interrupt big attacks if needed. Any number of combinations of professions can slow, immobilize, or otherwise hinder movement for extended periods of time. That’s just taking their skills at face value. Of course none of those cool sounding abilities actually matter in PvE content. The enemies are either so weak the skills are inconsequential, or the enemies are outright immune to them. Arenanet should be building all these skills, in addition to defensive boosts and healing skills, up to viable levels. Making “challenging” content that requires those kinds of abilities on one hand… while at the same time rendering them useless for big encounters on the other like they are now… I just don’t understand it.